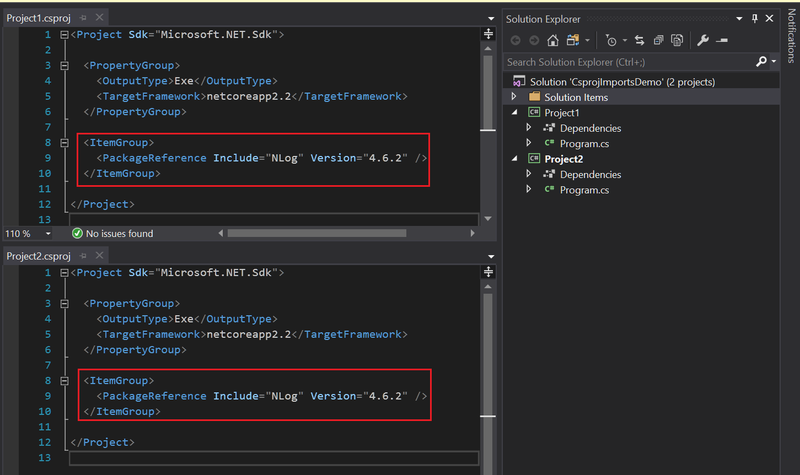 Recently I learned about a pretty simple feature that is super useful when working with .NET solutions that have several .csproj files, and the same NuGet package dependency in two or more of them. But this means that whenever you want to update this dependency, you need to do it separately in each project… and I hope you don’t have too many of them. Note that I used .csproj.include for the shared csproj file; the extension doesn’t actually matter. Now whenever you need to update that dependency, you can do it in a single place and all the projects that reference that file will keep their versions in sync. The only caveat I’ve found with this method is that Visual Studio’s “Manage Nuget packages” dialog doesn’t play well with it. If you use it in any particular project to update the package defined in the common file, a new PackageReference will be added to that project file, and the Import statement will remain. This won’t cause a build error, but depending on the order of the PackageReference and Import elements in your project file, might end up causing one or other version of the package to be used. So make sure that your whole team understands how these shared dependencies packages need to be updated going forward. This entry was posted in Software Development and tagged csproj, dotnet-core, msbuild, nuget on 2019-04-13 by alexvy86. For a long time now, I had a script where I was passing --no-build to a dotnet test command, because otherwise it got stuck in a very weird way. The tests never started running (in fact the build never finished), and if I hit Ctrl-C to stop it, even though it apparently stopped, something kept running in the background and printing warnings to my console, on top of whatever else I was doing. I googled keywords from the warning and couldn’t find anything relevant. Today I had to deal with this script again and decided to fix it once and for all. – Start a test environment with several containers using docker-compose. – Figure out which ports were exposed on the host for some of those containers and export them as environment variables (so the project being run with dotnet test sees them). 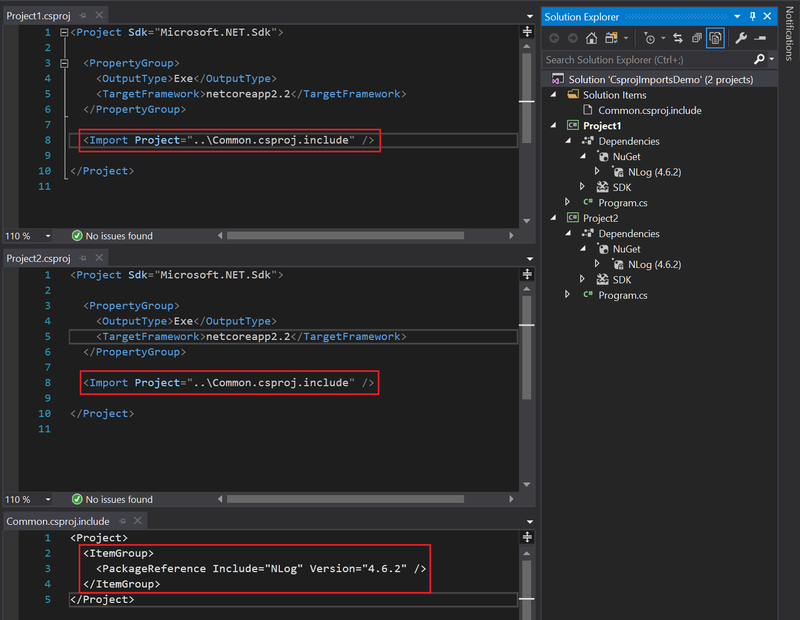 – Run dotnet test to execute the tests in a project. – Use docker-compose to remove the environment we spun up earlier. So I started troubleshooting my dotnet test command. That’s (part of) how I get the port that was exposed for a particular container, but I refused to believe that executing docker port had anything to do with the problem. So I tried renaming TMP to TMP_PORT_INFO… and what do you know, the script didn’t get stuck anymore! I couldn’t find any official documentation about this, but it seems like dotnet build (which dotnet test runs implicitly) depends on the TMP variable to be a path to a temporary storage location for the system. A bit of research made me think that in UNIX, the relevant variable is TMPDIR, but in Windows it’s TMP. So there you have it. If you want to avoid some painful troubleshooting, just don’t use TMP as a variable name in your scripts. This entry was posted in Software Development and tagged dotnet-core on 2019-04-05 by alexvy86. Nevertheless, systems running MongoDB do not need swap for routine operation. Database files are memory-mapped and should constitute most of your MongoDB memory use. Therefore, it is unlikely that mongod will ever use any swap space in normal operation. The operating system will release memory from the memory mapped files without needing swap and MongoDB can write data to the data files without needing the swap system. So enabling swap didn’t solve my problem of dying instances, but it’s something that the server should have anyway so I left it enabled. The default WiredTiger internal cache size value assumes that there is a single mongod instance per machine. If a single machine contains multiple MongoDB instances, then you should decrease the setting to accommodate the other mongod instances. That sounded pretty promising! I started by looking at my instances to see what the current value was. You can do that by running db.serverStatus().wiredTiger.cache in the Mongo shell, and looking for property “maximum bytes configured” in the output document. Sure enough, the server has 16GB of RAM, and those ~7.8GB are more or less what I’d expect based on the 0.5 * (RAM-GB - 1GB) calculation in the docs. The issue is that all five instances have the same value! So off I went and changed that setting to 3GB instead… and voilà! Stable DB server again, even with 5 separate instances of Mongo running in there. This entry was posted in Software Development and tagged azure, linux, mongodb, wiredtiger on 2019-03-02 by alexvy86. For several months now I’ve been struggling with an issue that showed up after I managed to set up Wake on Wireless LAN (WoWLAN) on my desktop computer, and I thought the whole process it would make for a great blog post, so here we go! Chapter 1: got it to work! Make sure the BIOS would allow it. Configure the wireless NIC settings in Windows. The first step was about looking for the appropriate settings in my BIOS, and setting them to the correct values. Some people might not be able to complete this if their motherboard/NIC/BIOS doesn’t support WoWLAN, and in that case there’s not much to be done other than changing hardware (or making sure it’s not just a missing BIOS update, which it probably isn’t). In my case, the only relevant setting (and maybe not even that, since I only use WoWLAN with state S3 (sleep), not S4 (hibernate) nor S5 (soft-off)) was S4/S5 Wake on LAN. For the second step I went to Device Manager, double-clicked my wireless card under “Network Adapters”, and made sure that Wake on Magic Packet and Wake on Pattern Match were set to Enabled in the Advanced Settings tab; and that “Allow this device to wake up the computer” and “Only allow a magic packet to wake up the computer” were checked in the Power Management tab. And voilà! I was immediately able to put my computer to sleep, and wake it up with a Wake-on-LAN packet sent through the WiFi. Things were great until I noticed that my computer was waking up on its own every night after I went to bed and put it to sleep. It was clear that the NIC was responsible for waking up the computer, and sure enough, if I disabled its “Allow this device to wake up the computer” setting in Device Manager, the problem went away. But that setting is needed for WoWLAN to work, so I started looking for a solution. Playing around with the other settings in Device Manager didn’t help. Intel provides some documentation on those that was pretty useful. For obvious reasons, of particular interest were NS offloading for WoWLAN, ARP offloading for WoWLAN, GTK rekeying for WoWLAN, and Sleep on WoWLAN disconnect. The first two let the OS “delegate” some work to the NIC when it is sleeping, so that some things can happen without it waking up. They are enabled by default, and it sounds like that’s the way it should be. The documentation for GTK rekeying for WoWLAN is not clear on what it does, but some additional research shows that it’s related to the PMWiFiRekeyOffload standard keyword for power management, which says “A value that describes whether the device should be enabled to offload group temporal key (GTK) rekeying for wake-on-wireless-LAN (WOL) when the computer enters a sleep state.” So just like the previous two, we want that enabled. I don’t remember what else I did to try and fix this, but if there was anything else, it didn’t work. After a while, I resigned myself and didn’t even try to put my computer to sleep before bed. Some time later I came back to the issue and this time my research first led me to the powercfg utility. Just to be sure, I also went through all the tasks in Task Scheduler, trying to figure out if a scheduled action was the culprit. A couple of them seemed like potential candidates but few of them could wake up the computer, and they were disabled or had schedules that didn’t match the symptoms I was seeing. Chapter 4: found the root cause! Fast forward another month or so, and I found a new clue: the wake up from sleep didn’t happen only during the night, the time of day didn’t matter! My computer is usually on all day, so I hadn’t noticed that before. But putting it to sleep at any time during the day resulted in the same wake-up-on-its-own behavior after some time. And more importantly, the computer always woke up on the 41st minute of the hour. Knowing that, I did some more research and found this question in the Intel forums, with a superbly documented reddit post by someone having the exact same problem. The author of that post did A LOT of research and troubleshooting, and found out that his issue was related to the Group Key Update feature of WPA2, and concluded that the GTK rekeying for WoWLAN setting in the NIC probably had a bug, since it should have offloaded handling of the appropriate network packets to the NIC, without having to wake up the computer. I wanted to really soak up all the information there and make sure I understood what was happening, so I followed the research on that post and applied it to my scenario. AP Association Lost: i.e. the NIC loses its connection to the AP. My AP wasn’t restarting or anything similar, so that couldn’t be it. GTK Handshake Error: (here I had to go and research what “GTK” was. It’s not super relevant to this post, but here I found a great explanation) I’m not sure what could cause an error of this sort, probably something like changing the WiFi pre-shared key on the AP? I wasn’t seeing any errors in my AP/Router’s log, and besides the wake-up issue, my WiFi worked fine, so I guessed it was probably not this. 802.1x EAP-Request/Identity Packet Received: this only applies to WPA2-Enterprise, and since I’m using WPA2-Personal, it couldn’t be it. Four-way Handshake Request Received: thanks to all the reading I had done up to this point I knew that 4-way handshake is the process by which the AP and a wireless client establish keys (PTK and GTK) to encrypt the packets sent between them, and that my AP was configured to update the GTK every hour. And my computer was restarting every hour. So… We probably have a winner! I confirmed that this is probably the culprit by changing the GTK rekeying interval (referred to in my settings as “Group Key Update”) in my router. After that, the minute when my computer woke up changed to match the time of the AP restart, so I’m pretty confident that this is it. Yet, just like for that other person having this issue, having GTK rekeying for WoWLAN enabled wasn’t helping, so I’m inclined to agree that there’s a bug somewhere in Windows or the NIC driver. Speaking of which… I looked for updates to my NIC driver, and there was one but it didn’t help things. A workaround for those that can do this, is to increase the GTK rekey interval in the router. I was going to set it to 12 hours (at 9am/pm) so it didn’t happen while I was asleep, but my router only allows up to 2 hours. So I’m still leaving my computer on when I go to bed because I know it will wake up on its own not long after. I’ll keep my eye out for updates to the NIC driver and see if they help. In any case, I got a lot out of this ordeal. I learned about low-level details of WiFi connections like the Beacon Frame, the Beacon Interval and DTIM, plus some other things mentioned above. So even if the problem hasn’t gone away, trying to solve it has been a very productive endeavor. This entry was posted in Uncategorized on 2019-02-16 by alexvy86. A while back I noticed that my ISP was throttling my speeds for most things, and that using a VPN worked around that throttling. I use Private Internet Access (aka PIA) as my VPN provider (I’d recommend them any time, if you sign up here we’ll both get 1 month free! ), and I confirmed this with their desktop application running on my computer, but I wanted a way to centralize the VPN connection so I didn’t have to start one form each device in my home network. Luckily I use open-source firmware Advanced Tomato on my Asus R7000 router, and it can run up to two simultaneous OpenVPN clients. PIA can be set up in a bunch of ways one of which is with an OpenVPN client, so it was perfect! They even have a guide on how to set it up in Advanced Tomato. So I got everything working without much hassle… but my Internet speed was way worse than when I used the PIA desktop application. With the app I got my “line speed” of ~60 Mbps (what I expect to get from my ISP), but with OpenVPN on the router I got an average of 12 Mbps (I’ll only talk about download speeds, since my upload isn’t particularly fast anyway). Some research led me to decide that the router’s processor was the bottleneck, particularly due to the need to encrypt/decrypt traffic from the VPN tunnel. It’s a dual-core 1GHz ARM chip which apparently does not have native hardware instructions for cryptography, so it needs to do it with software and is thus limited by CPU speed. Some newer routers with newer chips are apparently getting hardware-accelerated cryptography. Keep that in mind when buying a router if you have a setup like mine. I tried tweaking some settings in the router’s GUI but couldn’t get any real improvement, so I resigned myself to lower speeds when I wanted to have the VPN on in the router. I’ve never been one for overclocking my hardware, but I read several posts about people doing it without problems so I went ahead and bumped my router’s clock speed from 1 to 1.4 GHz, and just with that, my Internet speed jumped from 12 to 18 Mbps. Not back-breaking, but a very appreciated 50% improvement! But the real game changer were the OpenVPN settings, which took me from 18 to 30-35 Mbps! The OpenVPN documentation has great explanations for all possible options if you’re interested in the details. In short, fast-io can help non-Windows systems by optimizing certain code paths, while sndbuf and rcvbuf control the send/receive buffer sizes for the UDP or TCP socket. Now, note that the specific number for sndbuf and rcvbuf will probably vary for each person/situation. The ideal value will depends on the latency to your VPN server, the reliability of the connection, and maybe other things. Regrettably, I don’t have a formula for you, so I’d suggest starting with a value of 524288 and then moving from there. In my case, 786432 was an improvement but going all the way to 1048576 gave me lower speeds. YMMV. This entry was posted in Uncategorized and tagged asus, hardware, openvpn, pia, router, vpn on 2019-01-06 by alexvy86. A few days ago I was containerizing an Angular web application and ran into an issue that I think is worth documenting for future reference. npm ERR! Failed at the client-app@0.0.0 build script. The first thing to know is that the Dockerfile was building and publishing the application in Release mode, not Debug mode (which I had been using to run it in Visual Studio). So first things first, I tried to publish it in Release mode on its own (not by building the Dockerfile) with dotnet publish -c Release MyApp.csproj… and that worked fine. So the issue had to do with the fact that the app was being built/published inside a container. With a bit of googling I found out that error 137 usually means that the process was killed by the Linux kernel when the system is running out of memory. So I looked at my Docker configuration (right-click the docker icon in the system tray, go to Settings, then Advanced) and saw that the Linux VM was configured with only 2GB of RAM. I’m surprised that isn’t enough, but I bumped it to 4GB to see if it made any difference… and it did! docker build now ran successfully! At some point I’ll figure out why my application requires so much RAM to build… but at least now I’m able to create the docker image successfully. This entry was posted in angular, docker, Software Development on 2018-11-11 by alexvy86.